TheRustedChain - The Blog: Milkshake Mondays, on Wednesday. This summer we have a new routine in our family: Milkshake Mondays. Sonic has 1/2 price milkshakes after 8:00pm. So, the kids have a few requirements throughout the week that they have to fulfill. Things like daily chores, reading, not fighting, & keeping up on math skills. If they do those things, I will go out on Monday evening and get milkshakes for everyone! So far, they've earned them every week. At some point recently Sonic changed their sizes and pricing on the milkshakes. And a few weeks back when I ordered 3 smalls and a large, the voice from the red button judgingly snipped back at me, "Ma'am are you SURE you want a large?? That's like 32 ounces of ice cream!" The Boy was with me and laughed like crazy. "Mom, I think you surprised her with your answer!" Well the red button shouldn't mess with me when I'm hormonal and just want a hot fudge malt. The order this week went a bit more smoothly. The red button nicely said, "Ma'am did you know we've changed our sizes recently? A large is now 32 ounces." *whew* No attitude from the red button this time. So Milkshake Mondays are a huge hit around our household. 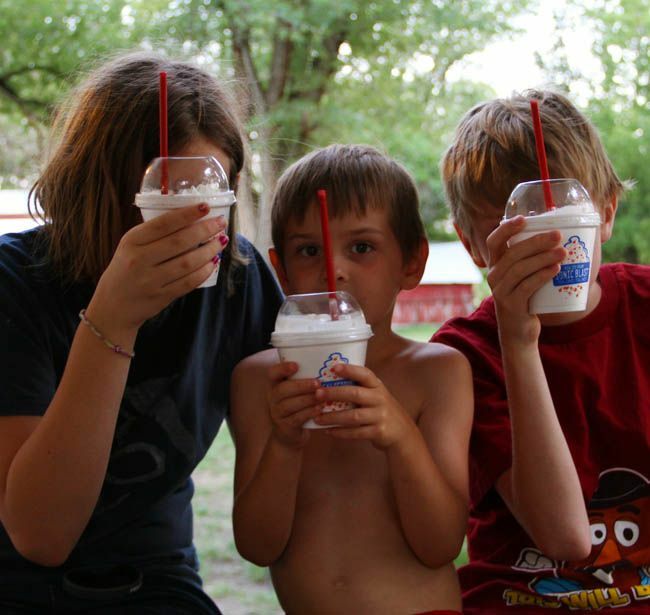 Today, Sonic is celebrating Summer by offering 1/2 price milkshakes all day long! So if you can, get yourself to a Sonic! But be aware that sometimes the red button has an attitude. Next time they show you attitude, tell 'em you're getting it to do a facial. Could this be considered Sonic's "trendy" way of being the opposite of a Super Size Me campaign? "Uhhh... do you KNOW how much ice cream that is???" Let's get America fit by being rude to them through the red button. No thanks- I'd rather have my LARGE milkshake! We went! We also walked up one night before bedtime and got half-price shakes. The kids thought that was fun, too. This afternoon we drove, though! :) On the way home last time (it's about .7 miles) my son (age 9) said,"Eating and walking is not my thing." He cracks me up. :) I like the idea of a weekly tradition, and that they have to earn it! Ah, gotta love Sonic... Your response to the little punk was too funny! I love it. shoot! too bad it's thursday. shame on me for not reading your blog yesterday. thanks for enjoying some for us! I was led to your blog thru pinterest for the graham cracker toffee. I'm going to make it right now! As soon as I saw your photos on your header, I knew you must be from Kansas. Me too! I live in Salina. I enjoyed reading your blog and now follow!